My second crack at a whole chicken! Okay, I cheated on this one too. I have no access to a kitchen at this time so I’m really reaching for straws. I found a whole chicken already stuffed in the deli. It turned out beautifully! Cooks 6 to 8 hours on LOW; serves 4. 4. Place in 4 to 6 quart crock pot. 7. Cover and cook on low 6 to 8 hours. 8. It’s done when stuffing expands to the point it starts to push out of the bird, and safe temperature is reached with meat thermometer. Delicious! Perfect as a meal by itself or add a veggie or salad as a side dish! i’ll run this recipe by my Amish friends and see if it passes the test..not..but i have seen them use some convenient ingredients before..they suffer from limitations in time and material at times..no electric crocks either..
my whole chick bath does not include stuffing or broth..i use water-sea salt-carrots,celery,rosemary, fresh if possible..or poultry seasoning..leave on all night, you’ ll have big chicken dreams, and tender meat for several meals, add noodles in broth when done..a tiny chicken will feed the two of you very nicely. i love the broth as a warm drink..bon appetit brave girl! I bet this was really great. I’ll have to ask Matt. Any leftovers? Nadine, I will try your chicken bath once we get in the house and back to the spice rack. It sounds lovely!! I don’t know why it was called Amish stuffed. That’s just what it said in the store! ha! Thank you always for all your ideas!! Thanks Mr. Pete! Leftovers didn’t last long! 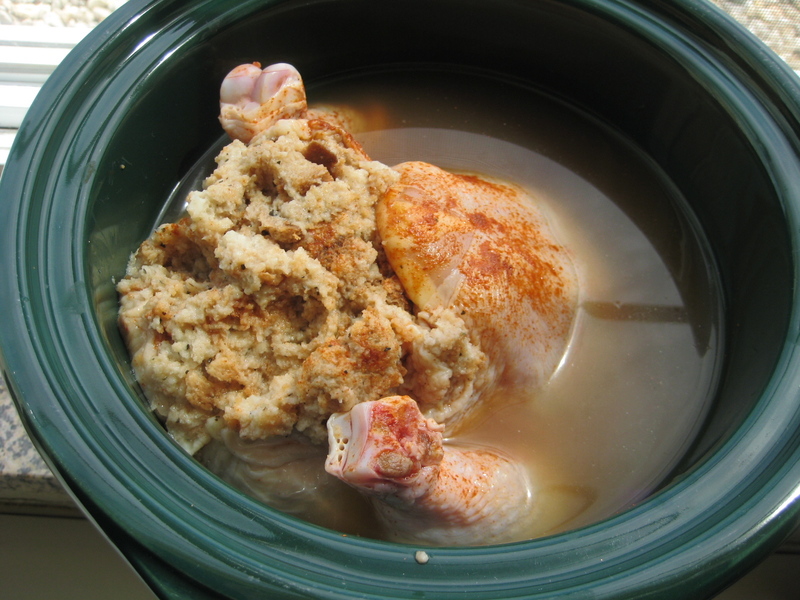 on May 14, 2013 at 8:10 pm | Reply Ewa "Mom Photographer"
I normally cook my chicken without any liquid in the slow cooker. I stuff the chicken with some veggies or oranges, rub some spices under it’s skin, cover and cook for about 7 hours on low. on May 15, 2013 at 1:47 pm Ewa "Mom Photographer"
Jay normally doesn’t like to eat the veggies that are cooked with meat in the slow cooker, so on this one I cheat. I normally turn some of the chicken into a BBQ pulled chicken. Ewa, He is so picky. You have the patience of a saint! Good trick!